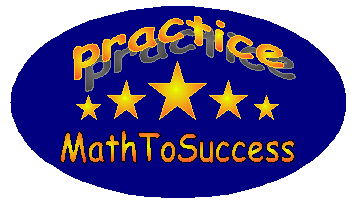 This is a demo of Math Olympiad 5. Your next practice questions in a specific program will be specially tailored for you as the system learns from your previous practices! of the number at the very beginning. How many people left the meeting during the process? 8 copies of a book cost less than $10. However, 10 copies of the same book cost more than $11. At least how many cents would a single copy of the book cost? Two cars are driving towards each other from place A and place B, both at a constant speed. They started out at the same time. When they met for the first time, the meeting place was 115.6 miles from place A. Both cars were immediately drove back when they reached place B and place A. When they met for the 2nd time, the distance between the meeting place and place A was 64% of the distance between place A and place B. Find the distance between place A and place B (in miles). Steve wants to rent a car for a round trip with a total of 130 miles. There are four plans available as below. Which is the best choice for Steve? A) Plan D charges $75.00 with an additional charge of 20 cents per mile. B) Plan A charges $90.00 with no mileage fee. C) Plan B charges $82.00 with an additional charge of 10 cents per mile. D) Plan C charges $63.00 with an additional charge of 15 cents per mile. 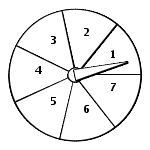 A spinner shown in the diagram has 7 equal sections. The probability of the pointer falling into each section is the same (Assume the pointer will never fall on a line between two sections). What is the probability that the pointer falls on an odd number? In the triangle ABC, BD bisects ∠ABC. What is the sum of u + v in degrees if ∠BAC = 60°, and ∠BDC = 83°. Note the diagram might not be drawn to scale and all the units are in degrees(°). How many whole numbers are there between 40 and 640 that have a 4 or 7 in their ones digit? One loaf of bread and 7 rolls cost $3.70. At the same prices, two loaves of bread and 3 rolls cost $3.00. How much does a roll of bread cost in dollars? Jessica went to a store and spent half of her money plus $7 more. She went to a second store and spent half of her remaining money plus $7 more. She then had $7 left. How many dollars did she have when she went to the first store?